SkylineGlobe 3D Web Application enables website users to navigate, analyze, and annotate high resolution 3D landscapes created by fusing aerial and satellite photography, terrain elevation data and other 2D and 3D information layers created with the SkylineGlobe products. Users can navigate through high resolution 3D landscapes, and overlay the terrain with geo-referenced, satellite or aerial images and elevation raster, as well as feature layers. SGWP increases understanding and improves decision making with powerful analysis tools, including Terrain Area, Line of Sight, Viewshed, Threat Dome, Flood Analysis, and Volume Analysis. The tools offer extremely flexible measurement and display options so that you can easily calculate and visualize the information you need. Users can easily and efficiently set and edit object parameters to their specifications, from object color and precise position to tooltip or timespan. Objects can be modified using their property sheets or directly in the 3D window. 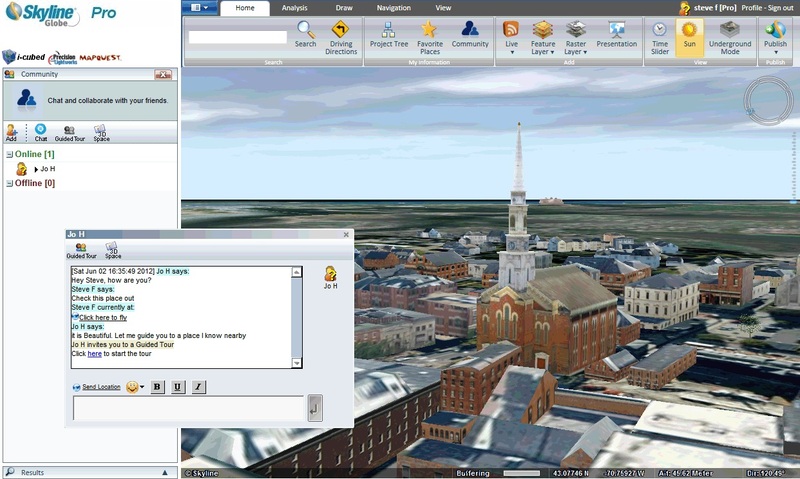 SkylineGlobe's 3D environment supports real-time collaboration among users across the organization. SkylineGlobe users can fly-through and study a 3D environment together, and make additions or changes to the 3D environment that will be seen by their partners. The application’s search function can be based on the Web Package’s included gazetteer or customized to connect to the organization’s own search engines. The search capability can be further enhanced by integrating turn-by-turn routing services into the application so users can get directions from any starting point to any end point. SGWP includes connectivity to various public live feed sources. Get current weather conditions and a seven day forecast for any U.S. location, or overlay the terrain with a selected weather map. View live feed to stay updated on financial and earthquake activity throughout the world in the past week. The application can be customized to add connectivity to other live content.